I recently had the chance to take the girls to Walt Disney world with my parents. I only agreed to the trip about a week out so we didn't make many plans. I checked the calendars at touringplans.com and chose one park to visit each day. Well, I've been busy since we got back and missed the start of our 180 day window on ADRs for our November trip. But I'm not worried. First, this last trip taught me that a table service lunch is the way to go. I had thought that counter service would be easier but add the chaos of Disney fast food to the craziness of two hungry, tired, yet still wiggly little girls and it's just too much input for me. I much prefer to sit and let someone else do the toting and fetching. And while, yes, my dad did frequently do alot of that for us, our meals were much more pleasant at the table service locations. And I'm not worried about ADRs yet because I have decided not to do character meals. Scandal, I know. But my oldest doesn't eat much anyway and if you add that to princesses walking around, well, you can guarantee she wouldn't touch her very expensive meal. Also, at age three, Tink doesn't fully understand waiting in line so I'd have to fight her throughout the meal about letting other children have their turn with the characters. I'd rather grab a Fastpass for Mickey and the princesses and keep mealtime a little more relaxed. 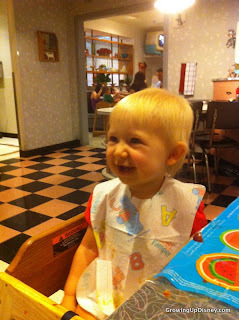 We'll venture back to the world of character meals in a couple of years. 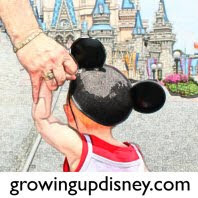 I worked at Crystal Palace during college program and saw lots of scenarios of kids and characters and think it is best if my family bows out for now. I would like to get our ADRs booked soon but we aren't planning on character or signature dining and we are flexible so it's still no rush. Another change I'm going to make on the November trip is cutting back on park days. This one hurts a bit. I'm the type that wants to get there early-ish, stay late and see as much as possible. However, that's just not a good plan with small kids. In May, we visited one park per day, arriving around 10 and leaving around 6. Even at that, we didn't see much of any one park and the heat really worked against us. So I need to revise the spreadsheet and cut the plan back. I'm looking at the two trips in 2012 as one big "to-do" list and we have already done the Studios. While I still want to get myself on the new Star Tours, I feel that the girls don't need to go back this time. 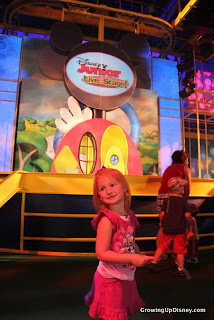 I took Tink to Disney Junior Live, Beauty and the Beast, and Muppets. She LOVED Mulch, Sweat, and Shears. Baby Minnie was really too young for much this time and she won't miss it if we bypass one park during our fall vacation. I'd even skip Epcot, my favorite park, if it weren't for the Food and Wine Festival. Tink got to take in the highlights of Future World in May and again, thinking big picture and that we'll be back over and over, she wouldn't miss a thing if she didn't go back yet. As it is, we'll stroll World Showcase and sample some treats at a slower pace than usual and whatever we happen to have time for will be good enough. One of the playgrounds installed for Flower and Garden is still there now with a Brave tie-in. Fingers crossed it hangs around. So...I'll be planning our trip primarily around Magic Kingdom and Animal Kingdom. Both have lots for the small set to do and we'll take a couple of days to explore each. While I doubt we make rope drop, I am going to try to get at least part of our group up earlier to take advantage of lower crowds in the morning, especially for Fantasyland. We also need to make more of an effort to get the girls to bed a little earlier but this time we will have a two bedroom at Old Key West. In May, the girls and I slept in the living room of a OKW 1 bedroom villa. It worked out fine but it's hard to get kids to sleep at a reasonable time while away from home anyway and then add that you are sleeping in the main part of the villa and, well, they stay up late. I'd guess I'd better get to it. Plans don't make themselves. Love making those plans! I think that's half the fun!!! I'm missing Disney right now so I'll vicariously through everyone else. We were just there in September and my daughter went for her senior trip a few weeks ago but it's never enough! Thanks for joining us as we plan! I hope you have another trip on the horizon soon. I love reading your blog and I am so sad I did not know about it 2 1/2 years ago when we took Kyle. I was 6 months pregnant with Cassie and well, let's just say I did not experience the "Disney Magic". We will be taking another trip in a few years and the second we book the trip - you will be the first person I call. Thanks, Emily! And of course, I'd be happy to help. By then I may be a travel agent too. :) Oh, poor thing, I went during the early months of pregnancy with both of my girls and it's not always much fun....but then again, being anywhere sick and swollen wasn't much fun so you might as well go on vacation anyway!